You may have guessed by the picture that this chapter has something to do with a Phil Rizzuto baseball card. It does. What you don't know is why! Read on! "Skye's the Limit" was my novel project for NaNoWriMo 2017. We'll just call it contemporary fiction/adventure. It follows the adventures of fortune hunters/pickers Phoenix Desertsong (yeah, original name) and Skye Stevenson and their crazy discoveries. You'll want to catch chapter one first. Feedback is always welcome. Enjoy! I was mortified by what just happened. I’d just watched a tween girl hold a baseball card and vanish in a flash of blue light. Skye walked in with a big grin on her face. She slapped me hard on the back. I double-checked my phone. That’s not what Wikipedia said. The Yankees won in 7 games. 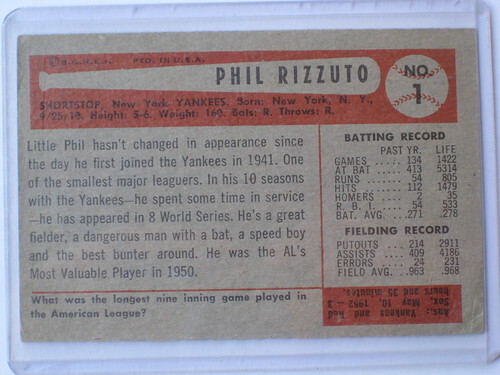 Phil Rizzuto was the MVP, hitting 7 home runs in the series. That simply wasn’t right. “How would you even know a thing like that?” Skye asked. “OK I’m confused,” Skye said with her typical blank expression. “Wait, you actually change the outcome?” I asked. Billy had no idea what she was doing. The 11-year-old had no idea what she’d done. She actually changed history. “You realize you’re actually changing real life, right?” I asked her. “There are!” she yelled excitedly. “Because it’s DANGEROUS!” I insisted. “I’m 11, I don’t know these things,” Billy said, wide-eyed. “How much you want for the whole lot?” Skye asked. “All the cards or just the time travelin’ ones?” Billy wondered. “Gimme a number,” Skye insisted. I shook my head. Those enchanted cards needed to be destroyed. At least, that’s how I felt at the time. I didn’t have the imagination necessary to foresee what SKye intended to do with them. Of course, Skye and I didn’t have anywhere close to that. We had 30 bucks, plus our rainy day fund which had maybe 200 in it. But we needed that fund for absolute emergencies like last minute repairs to our car or other unforeseen expenses. We didn’t have anywhere close to making her an offer. “How much just for the Rizzuto?” I asked. “But… but…” Billy was becoming extremely upset. But she needed to understand how absolutely dangerous these cards are. My eyes almost popped out of my head. Skye is always quite the deal maker. But that promise was nigh near unattainable. Until Skye signed a quick note with that promise, handed it to Nanny and we were in the car driving away, and she let me know her plan. Skye was right, as long as we could have someone front the money.